Fully grown, pegasi make excellent choices as companions on journeys, able to take to the sky at any sign of danger, and traveling almost as fast on foot as they do when flying. Extremely intelligent, they memorize trails and paths with ease, letting their riders trust their magical companion to guide them. Even in violent storms a pinto pegasus can find their way home with ease. Also valuable is their ability to forage and care for themselves, an ability which is useful on the road, allowing magi to carry lighter loads. In the wild, these creatures are extremely secretive, wary of all humans. A magi can only be graced with one of their offspring if deemed worthy, honorable and kind. Pinto pegasi are a highly sought after breed of pegasi, as they are rarer than the pure color horses. They have extremely soft coats in which the colors of both parents are displayed - dark gray and white spots, placed randomly over their bodies. Other than their coloration, these pinto pegasi appear to be no different in nature than their light and dark pegasi brethren. 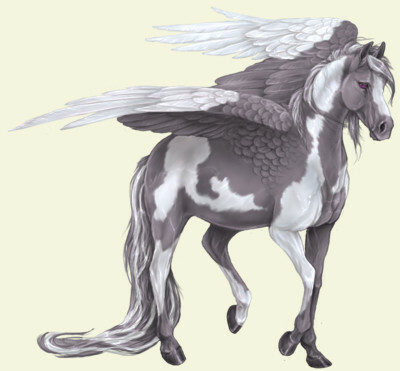 A pinto pegasus is a rare occurrence, the offspring of a union between a light and dark pegasus. Other than their unique coloring, these pegasi are like regular pegasi, and spend their time among them. When not grazing with one of the herds or caring for their young, these winged horses love to spend their time in the air, journeying to mountain tops. These horses can often be seen with a human companion on their back. Pinto pegasi have impressive wing spans that make it easy for them to carry riders, even while in flight. Their ability to fly for hours without tiring makes them an excellent choice for companion, enabling magi to travel to far away regions more quickly than the roads would allow. Pinto pegasi live just outside Sylvan forest, in the many fields outside The Keep. Although stables are kept for pegasi, these creatures rarely stay in one place for long.